This past weekend at New York Comic Con, Marvel made what is perhaps one of the most significant (and truly relevant) announcements of the year. 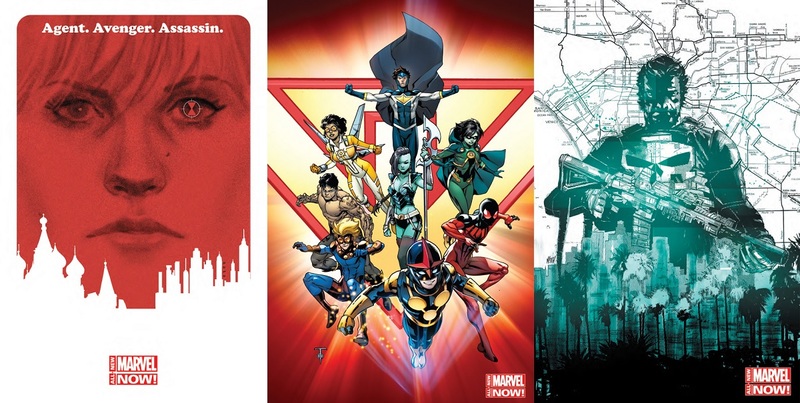 They announced in full their entire launch line-up for the next major phase of Marvel NOW! Following DC’s huge success with its New 52 reboot in late 2011, Marvel did the same last year with Marvel NOW! and now it is going full out with the next phase. While I think the title of this phase, All-New Marvel NOW! is rather clunky and weird, it is also a really promising time for readers everywhere. 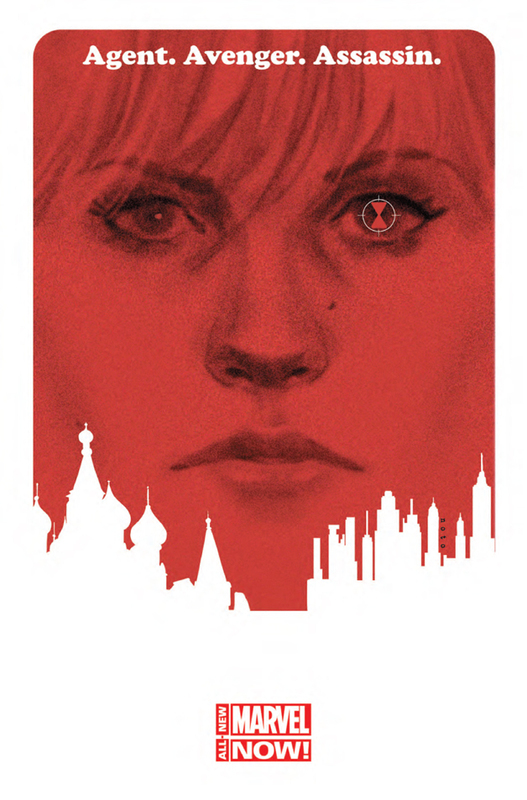 Black Widow #1, written by Nathan Edmondson and drawn by Phil Noto, releasing January 2014. New Warriors #1, written by Christopher Yost and drawn by Marcus To, releasing February 2014. Punisher #1, written by Nathan Edmondson and drawn by Mitch Gerads, releasing February 2014. 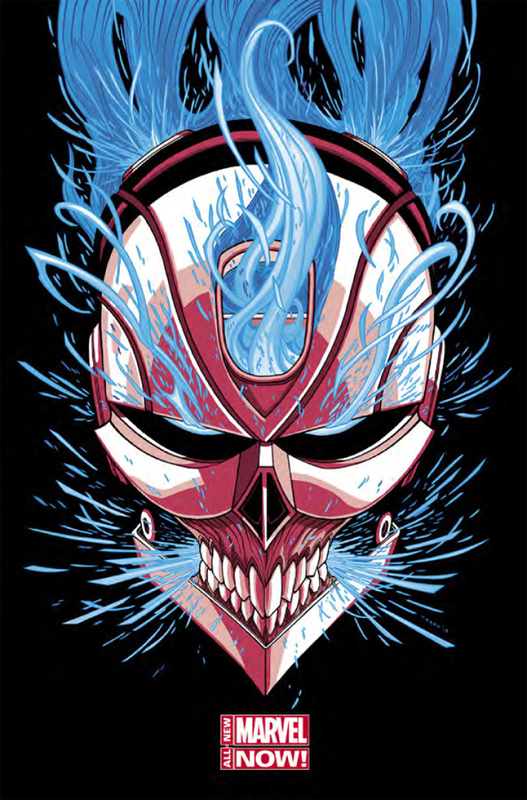 All-New Ghost Rider #1, written by Felipe Smith and drawn by Tradd Moore, releasing March 2014. Captain Marvel #1, written by Kelly Sue DeConnick and drawn by David Lopez, releasing March 2014. Elektra #1, written by Zeb Wells and drawn by Mike Del Mundo, releasing March 2014. Iron Patriot #1, written by Ales Kot and drawn by Garry Brown, releasing April 2013. 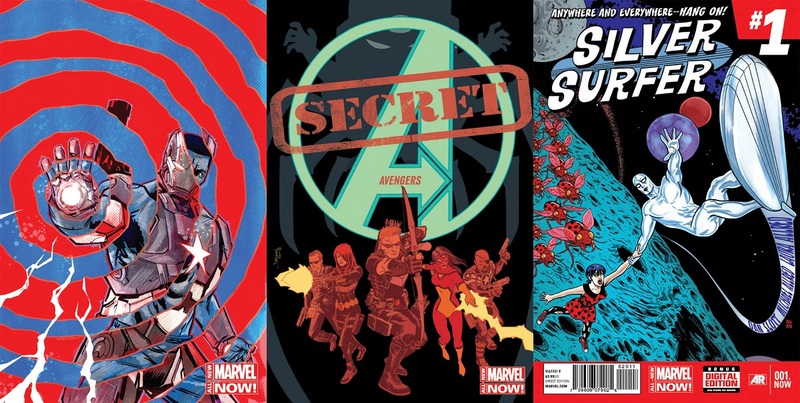 Secret Avengers #1, written by Ales Kot and drawn by Michael Walsh, releasing March 2014. 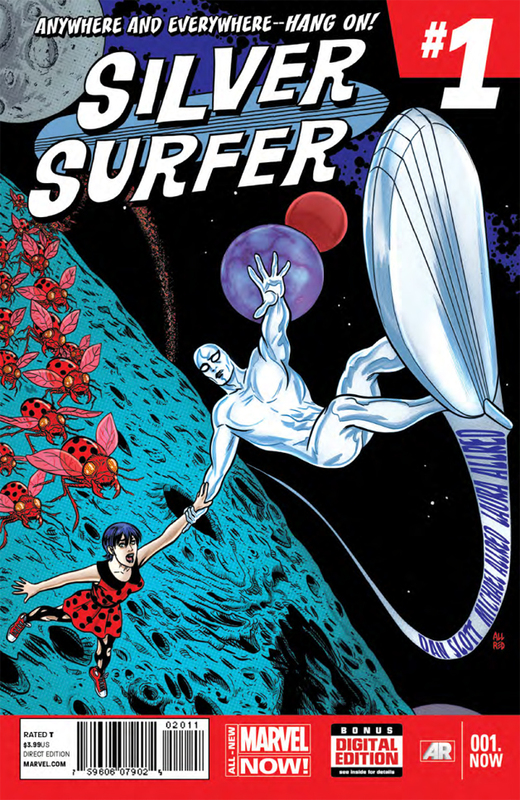 Silver Surfer #1, written by Dan Slott and drawn by Mike Allred, releasing March 2014. Now, some people might be wondering why I have male characters with solo books on this list, especially since I’ve been talking about diversity with gender et all. I mean, Ales Kot and Garry Brown’s Iron Patriot is a dead give-away since it has a black character as the protagonist. But what about Punisher, All-New Ghost Rider, and Silver Surfer? How do they all fit in? Well… given my particular definition of diversity (as mentioned all the way at the top), each of these titles has a place in the grand scheme of things. You will notice that I don’t have any “Adjective” X-Men or “Adjective” Avengers title on this list. That’s because there are already too many of those titles in circulation and All-New Marvel NOW! is going to introduce yet more. While titles like Mighty Avengers are pretty damn sweet in terms of diversity of all sorts, the proliferation of five bajillion Avengers teams and fifty bajillion X-Men teams starts to get old after a while. Additionally, and most importantly, such proliferation makes it really, really hard to get into Marvel comics. Its been one of my main concerns since Marvel relaunched their titles last year. I eventually settled on Jason Aaron’s Thor: God of Thunder and I’ve only recently started to experiment with Brian Wood’s X-Men, Kieron Gillen’s Young Avengers and Brian Michael Bendis’ All-New X-Men. Let’s take the first set of those images: Black Widow, New Warriors, and Punisher. The first of these should be pretty obvious as well. Black Widow has starred in at least two Marvel Cinematic Universe outings so far and she has become a fan favourite in a very short time. So much so in fact that a lot of fans, such as myself, are clamouring for her to get her own movie. She has been performed really well by Scarlett Johansson and I’d love to see her headline her own movie where she is the focus and we see her story, not as someone who is just another spoke in the wheel. By bringing out a new Black Widow comic, Marvel is positioning itself to take advantage of all the movie-related hype (which is well-deserved) and is also increasing the number of its female-led titles by one. They are increasing gender diversity between their titles and that’s a great thing. The second of these might not be obvious at all. And it wasn’t to me either, quite frankly, until I really looked at the cover. Unless I’m very much mistaken, and I might as well be given my lack of familiarity with the Marvel Universe, this New Warriors team has full-on gender parity, and is an even-split. And its all kids. As best as I can tell of the current line-up of Marvel comics, there are only two “sidekick” team books currently being put out: Young Avengers, which I’m reading and Avengers Arena, which I’m not. Adding in another team, especially one that is NOT named Avengers, and with such an even gender split, is another strong message. Marvel is basically acknowledging the incredible diverse nature of their characters and it is also getting the one-up on DC, which has only one “sidekick” team book, the justly-maligned Teen Titans. And let’s not forget that going off the cover, there’s also some thought given to racial diversity. That’s something else that I find appealing, especially in the wake of Mighty Avengers which stars Luke Cage as the leader of the team. The third of these is the real kicker. But really, its quite simple, at least to me. The Punisher is an outlaw. He’s neither a good guy, nor a bad guy. He exists outside of all the usual strictures of the law and he does his own thing, whatever that may be. Is he an anti-hero? He very well could be. In a line-up that is full of morally black and white characters and teams, the Punisher is really going to stir up things and he is going to stand out. Recently, the live-action rights for the Punisher reverted to Marvel as well, if I remember correctly, and I see this new comic as a positive sign that at some point, possibly the tail end of Phase 3 or somewhere in Phase 4, we could see a Punisher cameo at the very least. Now that’d be awesome. The previous two Punisher movies that have been put out over the years have been pretty terrible and given how strong (for the most part) the MCU has been going, I’m expecting some great things from them if they handle the Punisher. They’ve certainly got the talent. They just need to bring it together. 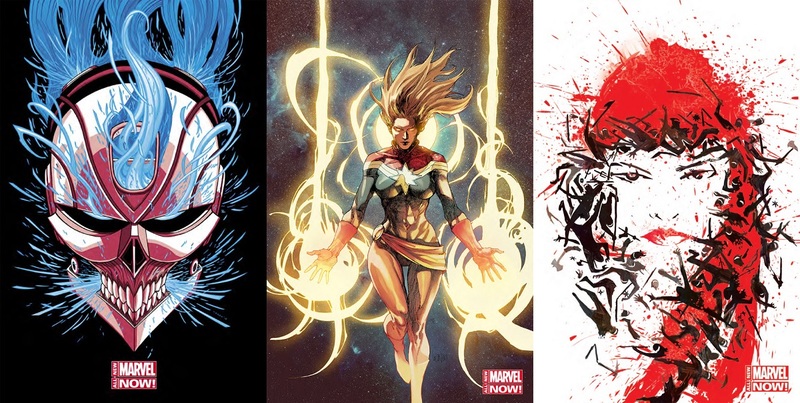 Now let’s take the second set of images together: Ghost Rider, Captain Marvel, and Elektra. My argument for Ghost Rider is the same as the one above for Ghost Rider. He is a character outside of all the usual teams, a truly fringe character and a loner. For him to get to his own book AND also star in the upcoming Thunderbolts relaunch under Charles Soule, is an incredible thing. The Marvel Universe in the Marvel NOW! phase is very upbeat and positive, counteracting all the grimness and grittiness of DC’s New 52. With this title, and with the Punisher, I see Marvel as acknowledging that not everything is as smooth as you might expect, more so than normal. Captain Marvel is a tricky one. She was relaunched last year as a part of Marvel NOW! with Kelly Sue DeConnick herself, and this second relaunch in such a short period of time is confusing to me, especially since they are beginning over with a new number #1 issue. I don’t know how the sales on the title have been, but I’ve heard that the series has struggled with a consistent artist at the helm. Certainly, that was one of my major pet peeves with the first arc in fact, which I read earlier this year. Still, its great to see that the title is not being abandoned. If it had been DC at the helm, Captain Marvel would very well have been axed without hope of resurrection. Fortunately, things are not so. And given how generally popular Carol Danvers has been, its fantastic that Marvel is committed to keeping her in circulation. I’m certain that calls for Carol to get her own movie have also helped in no small part. Elektra, she gets the same argument as the one for Black Widow, with the difference that she did headline in her own movie, a rather disastrous effort as it turned out. Still, I wouldn’t really blame the character at all for that, I would blame the writer(s) who delivered a poor script. An incredibly promising character was mistreated and the results speak for themselves. This title is another one for the gender diversity side of things. And Elektra contrasts with Captain Marvel and Black Widow quite superbly since she is a completely different type of character. But, she is equally badass. And now for the final set of images: Iron Patriot, Secret Avengers, and Silver Surfer. Like I said earlier, the first one is quite obvious. James Rhodes is the one wearing the armour. Fans will recognize the name from the MCU, where he has starred in all three Iron Man movies and has had quite a central role. That is of course if you are not familiar with him through the comics. Iron Patriot is in the current Secret Avengers roster, unless I’m mistaken and for him to get his own title speaks volumes. Its as if DC suddenly decides to let Cyborg have his own title in the New 52. DC made some inroads along that line with a couple other characters during their relaunch but the idea fizzled out due to poor sales and shoddy marketing. With Iron Patriot, I’m really hoping that Marvel can avoid all the pitfalls and really sell the character. Given his MCU popularity, on par with Black Widow’s, I’m really hoping that that happens. With Secret Avengers, the reason I picked that book was because of two things: gender parity, and racial diversity. The book, a relaunch of its current iteration, features Black Widow, Hawkeye, Spider-Woman, Nick Fury and someone else that I’m assuming is Agent Phil Coulson, another MCU fan-favourite. So this title has a lot going for him and is powered by characters who have featured in the MCU from time-to-time, except for Jessica Drew aka Spider-Woman. I’ve read the 7-issue mini-series by Bendis and Alex Maleev, and I really liked how Spider-Woman turned out in those stories. I hadn’t heard of her before, and her addition to this team makes me really hopeful given the company she is in. She’d be a fantastic counter-point to everything that is happening with Amazing Spider-Man, assuming that Marvel has the movie rights to her character (which is doubtful, sadly). Regardless, a high-end B-lister character being featured alongside other high-end B-lister characters. What’s not to love? And finally, we have Silver Surfer. Norin Radd. I’ve been a fan of the character ever since I saw the short-lived animated series ages ago. It was quirky and it was wonderful and it was a downright shame that it was cancelled, for whatever reason. I haven’t read any of the comics, apart from the somewhat mediocre Silver Surfer: Devolution GN by Greg Pak, but I did see the… unworthy second Fantastic Four movie featuring him, so I have some background of the character beyond the animated stuff. The reason I include this series in this editorial is because it represents Marvel going all-out with its cosmic comics. We already have Nova, and Guardians of the Galaxy (which is also getting a relaunch for All-New Marvel NOW!) and Captain Marvel, so the cosmic side is neatly covered. But really, Silver Surfer exemplifies Marvel space opera as far as I’m concerned. And he is all the more important because he is a headlining hero who is NOT of Earth. This goes back somewhat to my point about geographical diversity, but really is about Marvel tapping into its incredibly rich character base and giving screen-time to someone who hasn’t been around for a while, not as part of an ongoing at the least. And, having seen some of writer Dan Slott’s recent NYCC interviews about this book, I am super pumped for this. Can’t wait! So there you have it. A short and sweet piece on how I think Marvel is doing a great job of increasing diversity within its comics given the current status quo. I had originally planned to do this as a comparison piece and look at how DC is handling things as well, but that would have been too long. Besides, DC didn’t announce any new books during NYCC that I could then tap into and talk about diversity for. Which is a real shame, especially since I’m such a heavy DC reader. Posted on October 17, 2013, in Comics News, Editorial, News and tagged Ales Kot, All-New Ghost Rider, All-New Marvel NOW!, Black Widow, Captain Marvel, Christopher Yost, Comics, Comics Diversity, Comics News, Cosmic, Dan Slott, David Lopez, Diversity, Editorial, Elektra, Espionage, Felipe Smith, Female Superheroes, Garry Brown, Ghost Rider, Iron Patriot, Kelly Sue DeConnick, Marcus To, Marvel Comics, Marvel Now, Michael Walsh, Mike Allred, Mike Del Mundo, Mitch Gerads, Mutants, Nathan Edmondson, New Warriors, News, Phil Noto, Punisher, Science Fiction, Secret Avengers, Silver Surfer, Superheroes, Tradd Moore, Zeb Wells. Bookmark the permalink. 6 Comments. Maybe we count differently in the U.S. but I see 5 male and 3 female characters on the cover of the New Warriors. How is that gender parity?